Zooplankton, small animals that swim about in open water (Figure 20), are primary consumers. They graze on algae, bacteria, and detritus (partially decayed organic material). Some species can be seen with the naked eye, although they are more easily observed with a hand lens or low-power microscopes. If you wish to see them, stare into the water of a pond or lake on a calm night with a flashlight beam shining from above. 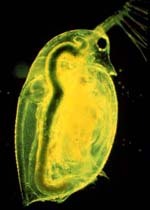 Secondary consumers, such as planktivorous fish or predaceous invertebrates, eat zooplankton. While photosynthesis limits plant growth to the sunlit portions of lakes, consumers can live and grow in all lake zones, although the lack of oxygen (anoxia) may limit their abundance in bottom waters and sediments. Benthic organisms are major consumers and are also important recyclers of nutrients otherwise trapped in the sediments. Benthic organisms include invertebrates and bottom-feeding fish. Their feeding strategies vary widely. Some, such as clams, filter small bits of organic material from water as it flows by. Others eat detritus that has sunk to the bottom. The spread of the exotic invader, the zebra mussel, has caused dramatic changes in the water quality and ecology of Lake Erie in the past decade due to its high rates of filtration and high reproductive rate (See Ohio Sea Grant). 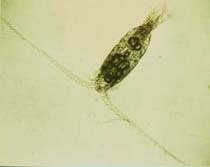 Not all organisms are easily classified as planktonic or benthic. For example, Chaoborus,Dipteran insect larvae, remain near the sediments in daytime and migrate to upper waters at night. These transparent predators ("phantom midges") migrate upward to feed on zooplankton, and are, themselves, a favorite food for fish. Mysid shrimp behave in a similar fashion and have been shown to migrate enormous distances (>100 meters) in Lake Tahoe each night. The best known group of aquatic consumers is fish. Many small fish, such as sunfish and perch, primarily eat zooplankton. Tertiary consumers that prey on the smaller fish include larger fish and other carnivorous animals (loons, grebes, herons, and otters). Different species exploit different habitats (niches). Bass and pike are found in lakes that have beds of aquatic macrophytes suitable for spawning. Walleyes, on the other hand, spawn on a gravel bottom. Lake trout live only in very clear lakes with cold, well-oxygenated deep water. In contrast, carp are adapted to warm turbid, low oxygen lakes with mucky, high organic matter bottoms. View images of fish, Figure 21. Decomposers, which include bacteria, fungi, and other microorganisms, are the other major group in the food web. They feed on the remains of all aquatic organisms and in so doing break down or decay organic matter, returning it to an inorganic state. Some of the decayed material is subsequently recycled as nutrients, such as phosphorus (in the form of phosphate, PO4-3) and nitrogen (in the form of ammonium, NH4+) which are readily available for new plant growth. Carbon is released largely as carbon dioxide that acts to lower the pH of bottom waters. In anoxic zones some carbon can be released as methane gas (CH4). Methane gas causes the bubbles you may have observed in lake ice. The decomposers can be found in all biological zones of a lake, although they are the dominant forms in the lower hypolimnion where there is an abundance of dead organic matter. Oxidation of organic matter by the decomposers (respiration) in the hypolimnion is responsible for the depletion of dissolved oxygen over the course of the summer, potentially leading to anoxic conditions (no dissolved oxygen). There is no source of oxygen in the hypolimnion to replace oxygen lost through decomposition. Stratification prevents atmospheric oxygen from being mixed deeper than the thermocline, and it is usually too dark for photosynthesis. Consequently, a large volume of organic matter from a variety of sources (e.g., wastewater, sinking algae, dying macrophytes, and organic sediment washed in from the watershed) leads to faster oxygen depletion and often complete removal of oxygen in the hypolimnion. The resulting anoxia has a profound effect on both the chemistry and the biology of the lake.